I love when other parents share what their children enjoying playing with – it always helps me figure out what to introduce into our own toy rotation. 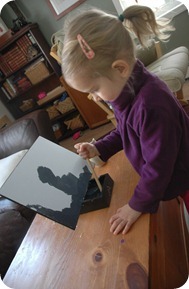 One of Claire’s favorite art tools since Christmas has been the Buddha Board. Everyone loves it! I’ve caught Dan doodling away many times and it was a big hit at Christmas dinner with all the grown ups. This is one of those “toys” that is not traditionally recommended for toddlers and preschoolers, (I can’t see why – it’s only water and rice paper) but I’ve found Claire has been a responsible user. I provide a small creamer of water and allow her to fill the container. 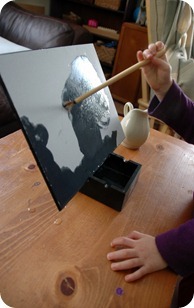 The brush has a built in resting place on the stand, the board leans back at a 30 degree angle for easy painting. It’s a really fantastic little self-contained unit and fits nicely on our end table in the living room. The high contrast of the water against the rice paper is awesome – it’s such a vivid, if temporary piece of artwork. 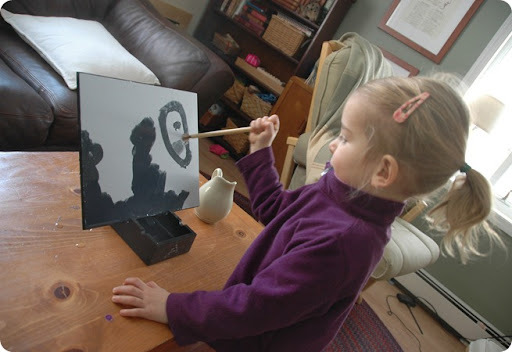 UPDATE: September 2015 — there is a kid-friendly version of the Buddha Board now with a full length lip to catch drips. It comes in a bunch of awesome colors too! Check it out on Amazon. I can’t tell you how much I’ve enjoyed the HOURS of quiet play this simple toy has provided. I can even picture Claire learning to write her letters on this in the future. She enthusiastically forms O’s and J’s and continues to draw her large headed little bodied humanoids, some of which I’m proud to say are portraits of yours truly. Claire happily paints on our chalkboard too but I am loving the compact design of this easel, it can move about the house so easily and offering it in new locations keeps it appealing. The only design flaw I can find is that there is no lip at the base of the board. When Claire puts a lot of water on it the drips run down all over the table. Of course it’s not the end of the world, but if I was redesigning it there would be a lip to catch the run off. I’m waiting for someone creative out there to create a DIY version of this, once they do I’m intent on creating a larger version! What are your kids enjoying nowadays? I love this! So I did some quick googling, you can buy the Magic Painting Paper and just pop it into any old plastic frame, sans glass and voila, customized Buddha board! So going to get some of this! Thanks for such a great blog! Next Next post: Oh My Sweet Beets!